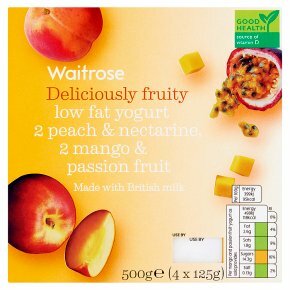 Waitrose deliciously fruity low fat yogurt 2 peach & nectarine, 2 mango & passion fruit Made with British milk. Our deliciously fruity low fat yogurt is made in the West Country in a dairy at the foot of the beautiful Mendip Hills in Somerset. It is gently blended with prepared fruit compote for you to enjoy anytime you choose. INGREDIENTS: Low Fat Yogurt (milk), peach (8%), sugar, nectarine (3%), inulin, maize starch, flavourings, concentrated lemon juice, colour (paprika extract), vitamin D.
INGREDIENTS: Low Fat Yogurt (milk), mango purée (6%), diced mango (6%), sugar, passion fruit juice (2%), inulin, maize starch, flavourings, vitamin D.